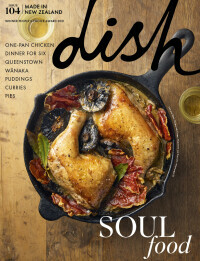 Delight in easy meals and fresh summer flavours – the February/March issue of Dish is here. Summer’s here and with it comes some fresh culinary inspiration – Dish’s Feb/March issue focuses on all the incredible innovation happening in the food world – particularly here at home. We get acquainted with some fresh new eateries in Auckland's buzzing downtown and meet the talented Nadine Levy Redzepi, to talk family, food and her brand new cookbook Downtime. For the sweettooth, Kelly Gibney shows us how to "chill out" during the warmer months with inspired frozen desserts, while Claire perfects our favourite sweet treat with Baked Cherry and Chocolate Croissants. Issue 76 marks a momentous step forward for Dish – with the debut of our silver foil masthead. We also have a brand new columnist to introduce, Nourish Group Executive Chef Gareth Stewart, who shows us just how easy it is to recreate restaurant quality meat dishes at home. To subscribe to Dish magazine today, simply enter your details here.